The Australian town of Bodgy Creek is going through rough times. Economically the town has gone through hardships due to the closing of the timber mill due to environmental concerns, a lowering population, and now the local football league The Roosters are in trouble for not adhering to safety standards and possibly having to go through a merger with a differing team. Bull (played by John Howard) the coach of The Roosters over the years will do whatever he can to save the team, but there is one thing he will not stand for and that is to have Troy be part of the mix. Troy Harrington (played by Damian Callinan) was a local hero years ago as an AFL star, but due to a serious leg injury in a game and later becoming an environmentalist that led to the closure of the timber mill, Bodgy Creek residents nicknamed him "Town Killer" and ostracized him over the years. Though disliked by everyone, he finds a way to save the team by employing refugees that have been recently relocating to Bodgy Creek and receiving government benefits. The townsfolk might be slightly hesitant about sharing the local work with outsiders, but Troy must gather up everyone together to save the town he once felt was home. In 2010, comedian Damien Callinan debuted the one man stand up routine entitled "The Merger", about a former AFL star coaching a small footy team filled with locals and refugees, exploring the comedy of local sporting while also seriously discussing racism. Callinan played all the characters in the stage show, and with acclaim over the years a project to adapt the show into a feature film was inevitable. The entire script had to be extended with additional scenes and additional characters to make it into a feature, and casting for each part had to be done as Callinan was not going to play every part like the stage show, though he would reprise his role as Troy. "The Merger" may have Australian Rules Football as the center which may limit the appeal of non-Australian audiences, but even without knowing the rules of the game, it is certainly enjoyable as the basic core is not about the sport but about the camaraderie and awkwardness between the characters, and there the story shines. From the curious Syrian Sayyid (played by Fayssal Bazzi), the mostly dumb but occasionally surprisingly bright Goober (Nick Cody), the inventive Snapper (played by Josh McConville) the bullying Carpet Burn (played by Angus McLaren, or the painterly Harpo (played by Ben Knight, the film is filled with a great cast of characters with each having a particular quirk. Not part of the original show but added to the film were Bull's family, with his daughter in law Angie (played by Kate Mulvany) and his grandson Neil (played by Rafferty Grierson), who are both very important roles in the film. With Angie working at the refugee center and being a love interest for Troy, and young Neil being the instigator with his handy video camera, they are certainly ones that move the story along by adding a connective tissue to the drama and also providing quite a bit of laughs along the way. From the comedic standpoint the laughs are full on with lots of hilarious moments throughout being well written and well performed, but one must not forget the drama and the more serious aspects in the story. The plot of having refugees be part of the football team does have some comedy involved such as some of the locals not knowing about some of their new neighbor's basic customs, but on the other side there are the racial differences that cause problems. Frequently calling the refugees "refos", not wanting to incorporate them into their town for basic needs, not accepting outsiders are issues that are often seen. Some of the refugees talk about their times living in hiding, seeing their family members murdered, or never being able to see their relative again are at times heartbreaking. The clash between the local and the refugees make for comedic hilariousness as well as frustration and anger. "The Merger" equally balances comedy and racial drama, and the adaptation written by Callinan himself is a fantastic one at that, by keeping the spirit of the original one man show while adding more depth in the process. Directed by Mark Grentell, the film received 2 AACTA nominations, (Best Lead Actress for Kate Mulvany and Best Supporting Actor for Fayssal Bazzi) and a nomination for Best Casting at the Casting Guild of Australia Awards. Umbrella Entertainment presents the film in the 2.35:1 aspect ratio in 1080p AVC MPEG-4. Shot digitally and being a recent release, it's a very clean looking transfer with bright and bold colors and excellent detail throughout. The bright greens of the grassy fields look great, the skin tones look natural, and there are no errors or encoding issues to speak of. It's an excellent transfer from Umbrella. The film's runtime is 103:13. The original 5.1 track is given the lossless treatment and sounds very good. It's not a film that relies too heavily on the surrounds being mostly dialogue driven, and the center based dialogue always sounds clear and crisp. The surrounds are used for ambient sounds and music cues which never overpower the dialogue. Like the picture, an excellent transfer of the soundtrack. There are optional English HoH subtitles for the main feature in a white font, with no issues with spelling or grammar to speak of. Featuring interviews with writer/actor Damian Allinan, director Mark Grentell, Producer Anne Robinson, and cinematographer Tony Luu, this behind the scenes look at the production discusses about the adaptation from a one man show, incorporating new characters, working with a multicultural cast, the music, the look, and much more. It may be short but covers quite a lot in the runtime. The original trailer is presented, and also embedded below. With no commentary, cast interviews, or other extras, it seems very bare in the extras section which is slightly unfortunate. The inlay is reversible, with the opposite side having identical artwork with the only difference being the Australian rating logo missing. The rear states "Region B" but this is a region ALL disc. 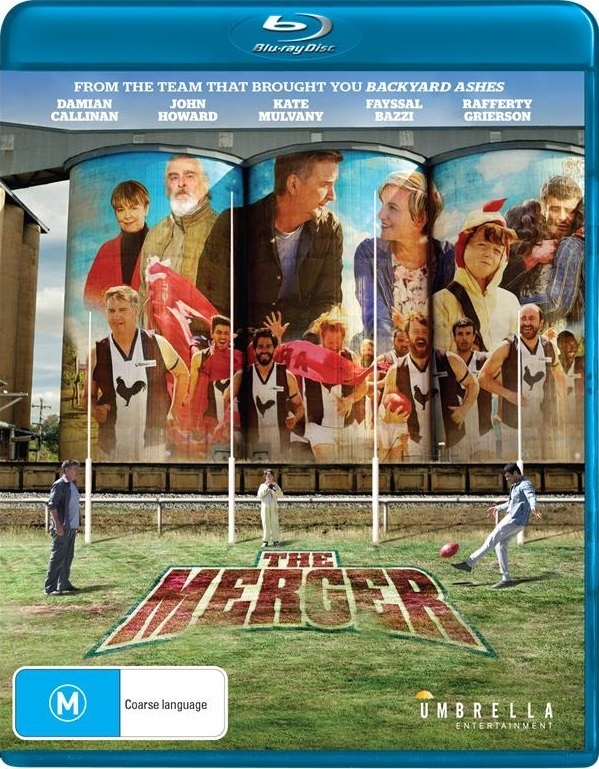 "The Merger" is a hilarious comedy that also looks at small town culture, acceptance of outside cultures, and being an Australian Rules Football film at the same time. It's not about knowing or not knowing the rules of the game but working together and having fun and that's what the film accomplishes. The Umbrella Entertainment Blu-ray presented the film with an excellent transfer, but sorely lacking in the extras department. Recommended.